"Books are exciting! ", But how many nine year olds would agree? Hopefully reading a book is an appealing option but in today's times i pads and gadgets provide stiff competition to old fashioned books. Getting a reluctant reader to pick up a book instead of a gadget is a challenge. There are many ways to get them excited about reading books. One easy way is to let them participate in Battle of the Books competition or at the lest attend the Battle of the Books finals competition at Silver Oak. Readers of two teams , "The Wimpy kids" from 3rd grade and "The Underdogs" from 4th grade competed last Friday in the final Battle. The audience was full of 3rd and 4th grade students all ready to cheer for their friends on the teams. The atmosphere was highly charged and both teams were ready with their hands to hit the buzzer at each question. Through out the competition, teams were either leading with very narrow margins or drawn. The Audience was kept at the edge of their seats till the very end and after a very close battle, team Underdogs won . Hearty congratulations to the winners as well as the runner up team- The Wimpy Kids for giving a tough fight. 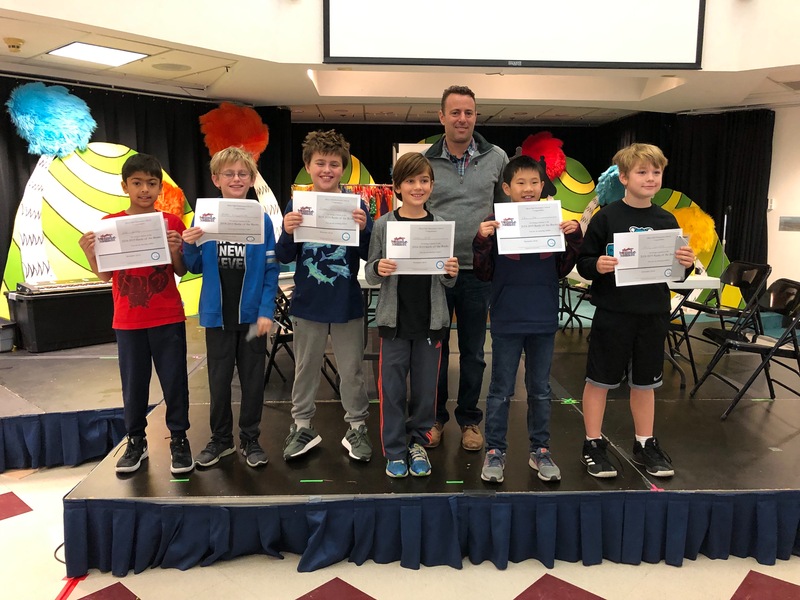 The team members of the "The Underdogs" are: Cayne M., Boston M.o, Ethan N., Noah C., Vedh R.,and Xander H..
"The Underdogs" were awarded an Amazon gift card and a champions certificate for their victory. To get an early start for next years battles, look out for the reading list on the school web page just before school is out for the Summer break.